The Wildlife and Forest Crime Analytic Toolkit, built on the technical expertise of all ICCWC partners as well as through extensive consultations with experts from across the globe from a variety of related fields, is intended to serve as an initial entry point for national governments, international actors, practitioners and scholars to better understand the complexity of the wildlife and forest crime, and to serve as a framework around which a prevention and response strategy can be developed. The Toolkit provides countries with a technical resource to undertake a national assessment of the main issues relating to wildlife and forest offences and to analyse preventive and criminal justice responses at the national level. The Toolkit is designed to assist government officials in forestry and wildlife administration, Customs and other relevant enforcement agencies in conducting a comprehensive analysis of possible means and measures to protect wildlife and forest and monitor products thereof, and thus identify technical assistance needs. 5. 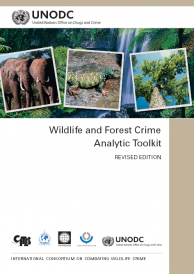 The availability, collection and examination of data and other information relevant to wildlife and forest crime. ICCWC will support countries interested in conducting the review during the entire process – including in mobilizing funds, hiring experts, analysing the results, and designing and delivering technical assistance. However, the implementation of the Toolkit is fully government-led. For further details, please see the ICCWC Toolkit Fact Sheet and the Toolkit implementation step by step guide. To enable Parties to measure and monitor the effectiveness of their own law enforcement responses to wildlife and forest crime, the Consortium has developed the ICCWC Indicator Framework for wildlife and forest crime, in consultation and with input from global experts in wildlife crime law enforcement and in the development and application of indicator frameworks. 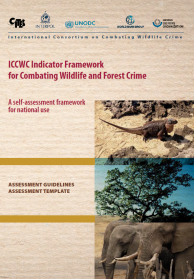 The ICCWC Indicator Framework complements the ICCWC Wildlife and Forest Crime Analytic Toolkit and is intended to provide a standardized approach to measure the effectiveness of national law enforcement responses and will also enable a Party to independently monitor performance over time to identify any changes in the effectiveness of its law enforcement responses. Designed to be completed as a self-assessment by national enforcement authorities, the ICCWC Indicator Framework consists of 50 performance measures that cover the major components of a law enforcement response to illegal trafficking in wildlife. The Assessment Guidelines provide an overview of the ICCWC Indicator Framework, and introduce the 50 indicators and the eight enforcement outcomes they are grouped under. It also provides practical guidance on completing an assessment using the ICCWC Indicator Framework and discusses the analysis of results including the more detailed exploration of results using the ICCWC Toolkit. The Assessment Template provides the full measurement details of all 50 indicators to conduct the national assessment. The Indicator Framework is available in English, French and Spanish. The Assessment Template is also available in Portuguese. For further details, please see the step by step guide. In support of the deployment of forensic technology to combat elephant poaching, ICCWC has also developed ‘Guidelines on methods and procedures for ivory sampling and laboratory analysis’, together with experts from around the world. The Guidelines are aimed at first responders, investigators, law enforcement officials, forensic scientists, prosecutors and the judiciary. Their purpose is to facilitate the use of forensic science to the fullest extent possible in order to combat wildlife crime, and in particular, to combat the trade in illegal ivory through the provision of guidance to support transnational criminal investigations and law enforcement operations. 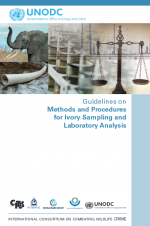 To complement the Guidelines, ICCWC has also developed a training video on ivory sampling that is available in English and French, as well as in Arabic and Chinese. 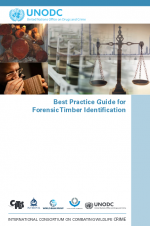 Following a similar format to the Ivory Guidelines, the 'Best Practice Guide for Forensic Timber Identification Guide', the guide aims to facilitate the employment of forensic science by front-line officers, crime scene investigators, law enforcement officials, scientists, prosecutors and the judiciary to combat illicit trafficking in timber. It covers the whole chain of custody, providing information on best practices and procedures from the crime scene to the court room, in order to ensure that forensic data are credible and admissible in court. Their purpose its to facilitate more timely, thorough and effective investigations, resulting in an increased number of successful prosecutions and a reduction in the illegal timber trade. In addition, ICCWC has developed a complementary 'Law Enforcement Best Practice Flow Diagram for Timber' to lead front-line officers through the steps that should be completed when dealing with a load or shipment containing timber. An online version of this Flow Diagram including dynamic links to additional resources will be available in due course. The Diagram is included as Figure 1 in the Guide. The ICCWC Menu of Services provides an indicative list of training courses, tools and services available through ICCWC, based on the ICCWC Strategic Programme 2016-2020. These can be delivered subject to funds availability and priorities identified in the ICCWC Strategic Programme. The courses are examples of activities that could be implemented by ICCWC in different countries or regions upon request and in collaboration with relevant national authorities or regional bodies and networks. Other specific and tailored training events can be developed based on the specific requests and requirements of countries and regions. The Wildlife Crime and Money Laundering training program (2016) is a four day workshop to help Financial Intelligence Units (FIUs), investigators, prosecutors and judges to overcome the investigative, legal and procedural challenges related to wildlife crime and money laundering cases. It aims to develop capacity to standardise procedures in detecting illegal transactions and suspicious activities, and to investigate, prosecute and adjudicate money laundering cases related to wildlife trafficking. Individual programme modules are being tailored to the needs of the different practitioners, to help them choose effective strategies, understand complex criminal patterns, reconstruct financial transactions, and apply relevant procedures or statutes. 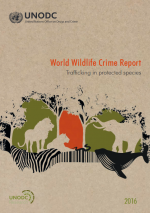 The first ever World Wildlife Crime Report (2016) takes stock of the present wildlife crime situation with a focus on illicit trafficking of specific protected species of wild fauna and flora, and provides an assessment of the nature and extent of the problem at the global level. The report looks at seven large industrial sectors that make use of wild sourced products and are vulnerable to wildlife and forest crime: seafood; pets, zoos and breeding; food, medicine and tonics; art, décor and jewellery; cosmetics and perfume; fashion; and furniture. It includes a quantitative market assessment and a series of in-depth illicit trade case studies based on evidence from 164,000 seizures in 120 countries, covering nearly 7,000 species. The CITES Virtual College provides capacity-building activities and reference materials online. CITES Virtual College, is hosted by International University of Andalusia. CITES on-line discussion forum is a communication tool created for the CITES Management and Scientific Authorities, permanent committees and working groups to exchange views, suggestions and information. These are closed forums which are not open to the general public. CITES Enforcement Authority Forum has been integrated with ENVIRONET. For details, see Notification 2015/039. CITES Trade Database is managed by UNEP-WCMC on behalf of the CITES Secretariat. It is a unique resource that holds over 11 million records of trade in wildlife and over 50,000 scientific names of taxa listed by CITES. I-24/7 is a secure network linking all INTERPOL member countries and giving access to INTERPOL's criminal databases. It enables authorized users to share sensitive and urgent police information with their counterparts around the globe, 24 hours a day, 365 days a year. I-link is a dynamic web application that allows officers in member countries to manage their data directly, and standardizes the format of the data exchanged. It will help make connections between seemingly unrelated investigations, by identifying common threads. Officers in National Central Bureaus (NCBs) and other authorized users are able to access I-link through the I-24/7 network. ECO-message is an intelligence data reporting system for the many different law enforcement agencies concerned in the fight against environmental crimes. Given the international nature of much of environmental crime, international cooperation between national law enforcement agencies is vital if the criminals involved are to be successfully apprehended and deterred. With the Ecomessage system, data are entered into the Interpol database where they can be cross-referenced with other entries. CENcomm is a tool that facilitates the exchange and use of data in a timely, reliable and secure manner with direct access available 24 hours a day. The application is hosted by the WCO Secretariat and users can access it via the internet using an ID and password issued by the WCO. ENVIRONET is an CENcomm internet-based global communication tool dedicated to environmental protection. This is where the WCO posts media updates related to wildlife crime and other environmental crimes, alerts, manuals, handbooks, and enforcement-related messages. The Green Customs Guide is a guidebook for trainees and trainers to be used as a core element during the training courses and as a post-course reference document covering the following organizations and conventions: Basel, Cartagena, CITES, Montreal, Rotterdam and Stockholm, as well as Interpol, OPCW, UNEP, UNODC, the World Customs Organization and the Organization for the Prohibition of Chemical Weapons (OPCW). Customs Control, risk management, profiling and selectivity is an e-learning module available on the World Customs Organization’s learning platform (note: restricted access). The WCO’s Risk Management Compendium outlines the risk management process and risk assessment, profiling and targeting tools that inform selection criteria for identifying high-risk consignments, passengers and conveyances for Customs intervention (note: restricted access to Volume 2).